After the Labor Day weekend and as the kids are back in school, our September newsletter features the announcement on our new MyAccount registration system that will allow you to quickly recall your order details, addresses and much more that we will be unveiling this month. 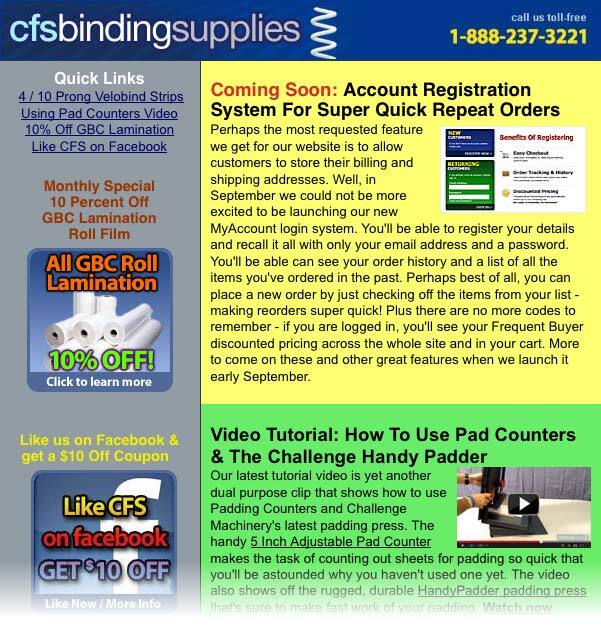 Our latest CFS tutorial video shows you how to use pad counters and the Challenge HandyPadder padding press. GBC Velo Binding Strips made an appearance in both 10-prong formats and 4-prong formats. To view the full newsletter, just click the image below. ← Can I Use Any Digital Camera With My Fuji IP10 Passport Printer?